You may remember this recent case where videographers working for the Discovery Channel (ostensibly lending them credence) in Mexico caught an unidentified flying object on video. To many - myself included - the "UFO" appeared to be a contorting bundle of mylar balloons. However, the newly stabilized image shows an object that appears to be continuously rotating and morphing like a glob of liquid suspended in space. It is really quite strange. Tracking Ghosts On Radar: Can Old Science Bring New Answers? 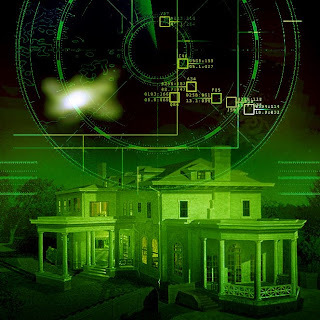 On a chilly November night in 1952, several ghost hunter embarked upon a journey to plumb the paranormal depths of a 200-year-old mansion in Hove, England with the latest technology - radar. The stately abode along the Channel Coast had long been rumored haunted by a ghost fond of moving objects about the house in a fashion now familiar to all who study such things. So bad were the goings-on that the homeowners were unable to rent the place for more than 20 years. Led by Ted Henty, five members of the Sussex Ghost Hunters set up shop inside the home, along a creaky old hallway. Here, the team members set up a radar screen, which was aimed down the passage (a rumored favorite of the spirit) and proceeded to seal all ingress and egress points. Just after midnight, the radar picked up a target that danced across their screen. Flash photos were promptly taken. However, in the brilliant bursts of light, nothing visible was revealed. Moments later, a creak in the floorboards was heard, followed by a cough, shuffling feet, and a loud bang before the radar unit was tossed aside by unseen forces. When the lights were once more turned on, all seals and locks were in place. None of the team's "ghost traps" had been tripped. I can't recall having ever read of a ghost investigation using radar. It seems a cumbersome and precarious device for such an endeavor, and yet I have to wonder if there isn't success to be found in looking at technology such as this. I welcome thoughts from any of the investigators out there. These may not yet be on the market and will most certainly require deft minds at the helm. Colorado man, Stan Romanek, whom you might remember from his assertions earlier this year that he had captured on video an extraterrestrial peering through a window in his home, agreed to a polygraph test for the benefit of Coast to Coast AM. The results are inconclusive and, when coupled with half-baked post-facto explanations, are likely evidence of a hoax at work. I recently finished reading Erik Larson's The Devil In the White City, a riveting look at two very different men who left indelible marks upon 1893 Chicago: architect Daniel Burnham, inarguable mastermind behind the World's Fair, and H. H. Holmes, pseudonym for America's own Jack the Ripper, Herman Webster Mudgett. While the former desired to elevate the teeming masses of the Windy City with revelations of beauty and majesty, the latter preyed upon the naivete of those very same wide-eyed innocents, newly arrived from the farm to the big city for the first time. SEE ALSO. While Holmes' evil was grounded purely in the realms of the terrestrial psychotic, his story occasionally hints at something almost supernatural. When investigators tore apart Holmes' large complex of retail spaces, hotel rooms, and drugstore, they discovered a letter addressed to the pharmacist under his employ. In this letter, Holmes asked the man a simple yet macabre question: "Do you ever see anything of the ghost of the Williams sisters, and do they trouble you much now?" Holmes had killed the two women in his basement of terror where he inflicted such horrors as asphyxiation, immolation, and dismemberment. But it is interesting to note Holmes' phrasing. "Do they trouble you much now?" This almost implies that the pharmacist had mentioned previously being troubled by the presence of the sisters' "ghost". While in custody, Holmes bragged to detectives that he was the Devil incarnate, a creepy thought if you factor in the tragedies that befell those who sent him to his death. The detective that brought him to justice fell seriously ill, the warden at Holmes' prison committed suicide, the foreman of the jury who convicted him died in a freak electrical accident, one victim's father died in a boiler accident, and the priest who administered last rites was found dead in the yard of his own church by causes unknown. But the creepiest of came perhaps when the District Attorney's office burned to the ground leaving nothing intact save for a photograph of H. H. Holmes. Did the devil truly prey upon unsuspecting tourists entranced by futuristic displays of electric light bulbs, giant "Ferris" wheels, and some of the largest buildings then constructed? Was there a dark malevolence afoot in the White City, as the Fair was then known? If you're one of those paranormal enthusiasts who like checking out cemeteries, perhaps you can find some activity surrounding Holmes' final resting place in Philadelphia's Holy Cross Cemetery. However, no grave marker denotes the site, which is located at section 15, range 10, lot 41 at the center of graves 3 and 4, just off Lazarus Avenue. Perhaps there was no one who cared to purchase a headstone. Or perhaps some evils are best forgotten lest they somehow arise once more. It should be interesting to note that his body lay encased in a cement filled coffin beneath 10 feet of cement. Ostensibly this was at Holmes' request; he didn't want curious scientific minds slicing him up in search of any physical evidence of evil. The folks at Cryptomundo have posted links to several podcast interviews with members of the Texas Bigfoot Research Conservancy while on location in the montane environs of the Ouachita National Forest, which straddles the Oklahoma-Arkansas border. According to the TBRC, this is a hotbed of activity for the furry fellow. It seems the Bigfoot Field Researchers Organization (BFRO) is gearing up for their own reality TV series, a la Ghost Hunters or UFO Hunters. You can read the details at Cryptomundo, but the gist is that the group is currently in talks with Canadian production company, Barna-Alper. So it is still a ways off from knowing yet what the format will be and when production will begin. It is a step in the right direction for a group that has slowly, over the years, moved closer to the limelight. BFRO and Loren Coleman are the two biggest sources for media quotes and are frequently mentioned in newspapers, magazines, and TV. It would appear that everyone in this day and age wants a piece of the Reality TV pie. But at what cost? While many will point out the benefit of bringing such fringe issues to the forefront, I wonder how the subject will truly be treated. Sure, there exist fears that a subtle mockery will be instilled, perhaps unbeknownst to the participants. But, really, my concerns are that this will deluge the field of cryptozoology with more poseur organizations, bent on cashing in and having a good time. The hard-earned respect the field had been striving to earn (already set back by recent events in Georgia) could possibly be laid a deadly blow. We've seen similar groups arise in the wake of T.A.P.S.' success on Ghost Hunters. The whole thing became glamorized and commercial. So, we ended up with countless acronymic entities, selling t-shirts and collecting haunted locations like they were "friends" on MySpace. Will a similar scenario befall the BFRO's endeavor? Or worse still, will the pressures to produce ratings-enticing results push the production staff into a bit of creative editing? Or will they resort to outright hoaxes? Perhaps they won't have to go that far. After all, people gladly tune in week after week to Destination Truth even though it manages to NEVER produce any results worth watching. A man who tragically passed in a train wreck, continued to call his love ones long after he had passed. Did a wreck-damaged cell phone dial randomly and repeatedly? Or does not only life extend beyond death but love as well? If EVP is a very real phenomenon, why can't it be heard in real-time? We've so often heard of the trying ordeal investigators must endure after a long vigil at some haunted locale: the hours of audio to sift through. But why can it only be heard once he or she has returned home? Is there not a way to hear the voice right away? These are the experiments I never hear about. Has such a procedure been tested with various equipment, perhaps parabolic microphones? Investigations into these questions might lead us to a clearer understanding of just what EVP is. I remember just a few years back, everyone was warned not to use digital recorders for EVP work because they wouldn't capture the sounds. But now most everyone uses them. I think it's a field of study that's not really being studied at all. There's no science backing the decisions, just trial and error. Wouldn't understanding how and why something works make for better research in the future? It is time we start asking these questions in order to not only have a clearer understanding of the phenomenon but also, maybe, a clearer understanding as to just what is being said - and by whom. Ghost Train Or Clever Hoax? Cuba, NM, a small town in the famed "Four Corners" area, was the site of an ironic UFO sighting Tuesday night as Scott and Suzanne Ramsey, in the area researching their upcoming book on the Aztec UFO crash, viewed the green, glowing orb flash past above them as they maneuvered through a parking lot. Coincidence? Or synchronicity? USA Today's science blog had an interesting article recently that spoke of rating the factuality of Internet sites to curb the spread of outlandish, unfounded beliefs. One recent example cited was that CERN's supercollider created a blackhole that will now slowly engulf the planet. While, I agree whole-heartedly with the thought process behind such an endeavor, I have to admit, it's a fool's errand. The Internet is information anarchy at its best. And that's probably the way it should stay. Users already know how and where to find reliable information. It isn't from a Geocities page about how Reptilians helped CERN produce the supercollider to drag the planet into their alternate dimension (delivery is SO much better than take out, don't you agree? ), it's coming from those entities that put themselves and their reputations on the line to deliver quality journalism. Of course, one wonders what kind of rating would sites like this receive. I try to be fair and balanced (most of the time) and demand rigorous supporting data for claims. But I also like to just relay a really fun story now and then. I don't consider this site to be the nexus of all knowledge. I don't believe any one source of information can be such a thing. When I wrote my book, I often had two or three different sources of information for any one given story. I wanted to be as thorough as possible and see as many sides as I could. I think only when readers and writers try to view a story from all angles, can the truth come to light. Ultimately, it is up to the reader to make an informed decision. "On the Web the thinking of cults can spread very rapidly and suddenly a cult which was 12 people who had some deep personal issues suddenly find a formula which is very believable," Berners-Lee told the BBC. "A sort of conspiracy theory of sorts and which you can imagine spreading to thousands of people and being deeply damaging." The dangers Berners-Lee cites are connected to a fault of our brains. "Even when a lie is presented with a disclaimer, people often later remember it as true," reported neuroscience experts in a recent Times opinion piece. "Consumers of news, for their part, are prone to selectively accept and remember statements that reinforce beliefs they already hold. [In a study,] researchers found that even when subjects were given a specific instruction to be objective, they were still inclined to reject evidence that disagreed with their beliefs." Prolific inventor (second only to Edison in number of patents) of such things as the Remote Control and Hammond Organ, John Hays Hammond had a love of antiquities and medieval architecture. To house his enormous collection of artifacts, Hammond constructed a castle on the shores of Massachussets Bay in Gloucester, MA. Many elements, such as the ancient French chapel, were brought stone by stone from Europe. However, along with the shipping documents and stuffing, some say spirits attached to various objects and structures also arrived in Hammond's castle where they have taken up residence ever since. The ubiquitous "Hum", which is currently making a splash near Loch Ness in Scotland (famed for another mysterious phenomenon altogether), can be heard from New Zealand to Indiana and all places in between by those individuals especially sensitive to this strange sound. There is no explanation for the low rumble, which many liken to that of an idling diesel, nor a particular pathology among the sufferers. Some seem to actually "hear" it, while others seem to detect the sound from within, so that earplugs and the like cannot keep the nuisance at bay. University of Oklahoma geophysicist, Dr. David Deming, has researched the Hum and come up with no clear cut answers. However, he and others theorize that a small percentage of the population, perhaps as much as 2%, can "hear" radio waves directly without aid of technology. And according to Dr Joe Elder and Dr. C. K. Chou of the Motorola Florida Research Laboratory, this theory isn't science fiction. 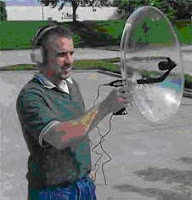 It simply requires humans with an uncanny range of hearing, especially high-frequency. In addition to standard radio waves, the government's experimental assembly in Alaska known as HAARP (High-frequency Active Auroral Research Program), which sends high-frequency radio waves into the ionosphere to produce and study controlled auroras, might produce an explanation if proper correlative data were collected. As it stands, there are none. It seems the Hum has been heard longer than HAARP has existed. But others dismiss these high-frequency explanations since the Hum is often described as Extremely Low Frequency (ELF) and not high, as the good doctors theorize. But could it be possible that a Hum produced by the Extremely Low Frequency broadcasters, such as those used by the Navy to communicate through the oceans with submarines, might have a similar effect on a small segment of the population? Who knows? But the list goes on and on: cell phones, GPS, mass-hysteria and paranoid delusions, especially when it seems to affect a great number of people bent upon blaming some "government conspiracy". Others have speculated that the sounds could be discrete phenomena (industrial noise in one area, medical condition in another) that become lumped together under the heading of The Hum by those who use the Internet as a self-diagnosing tool. And, in the end, it could be as simple as tinnitus, that pesky "ringing in the ears" (that can also sound like a rumble - try yawning widely). If that is the case, The Hum might be a great name for a rock band. In recent days, there as been an upswing in reported big cat (but not mountain lion) sightings throughout North America, as can be read on sites like Cryptomundo and Blogsquatcher. I wonder if there are patterns? Why all of the sudden? Has anyone ever tried to analyze the sightings for their statistical importance? In the spring of 1961, a lion seemed to be roaming loose in the vicinity of Big Cabin, OK. Although some said it was a coyote or wolf, most witnesses agreed it looked like a lion. The animal was witnessed alongside highways, sleeping in a barn, and wandering the countryside. The creature was also blamed for attacks on area livestock. Locals described the animal as an adult male African lion but none had been found missing from any nearby zoos. However, these reports were so compelling that zoo personnel, headed by Hugh Davis of Tulsa's Mohawk Park Zoo, joined veterinarians, and law enforcement in an intensive search for the beast while locals commenced to arming themselves. Bloodhounds and a plane joined in the search before too long. Zoo representatives were able to confirm that tracks found were from a very large feline of some type. One woman called Hugh Davis to report seeing the animal lying alonside the Will Rogers Turnpike. Joyce Propp and Gwenyth Frazier were returning to the Propp farm with Propp's childen when in their headlight's they spotted the lion. It was lying within a few feet of the Propp home, eating a chicken. In time, reports started to come in from as far north as Vinita and as far south as Claremore. In June of that year, and over a hundred and fifty miles southwest, near Duncan, an "African lion" was reported running loose by Mrs. Carl Payne, an employee at a local law firm. She reported seeing the creature in the bottoms of Wild Horse Creek, 14 miles northeast of the town. Mrs. Payne said it just stood by the side of the road and that she thought it might have been a Shetland pony at first glance. When Payne stopped her car, the lion disappeared into the tall grass by the creek. It was confirmed that "Tony" the lion at Duncan's city zoo was still at home in his cage. A hunt commenced for the creature with no results. What are the odds that two different lions would be roaming within weeks of one another? Was it the same animal? It's a long way to walk (even on four legs) from Vinita to Duncan. Incredible Journey, indeed! The prevailing theory was that this creature had escaped from a circus truck that had recently stopped in Adair. However, this was an unconfirmed statement - an interesting fact when weighing the long-standing argument over the "escaped animal" theory. Often times, opponents will dismiss that these escapes happen with any appreciable frequency. And when there is an escape, it will be properly reported and the animal quickly recaptured. The fact that no one knew for certain if this traveling circus had lost an animal bolsters my opinion that while the loss of a big attraction could cost a small circus money, a law-suit would certainly bankrupt it. The thinking is: pull up stakes and get out of town before anyone notices, in hopes that the animal situation will simply solve itself. This is especially likely with small, poorly funded circuses and animal parks where sometimes treatment of the animals is less important than the money they bring in. Sadly, no further reporting was found on this story. But a few years later, a similiar tale cropped up in the same region again. In March 1965, Tulsa residents began reporting vague accounts of a lion or such on the loose, killing pets and livestock. A dog was badly mangled and seven hogs had been slaughtered. Reports claimed the creature was waist high to a 6 foot tall man. Officials at the local zoo denied having any escaped lions or cougars. A cooperative effort between the Sherriff's Department and Tulsa Police yielded few results and no capture. Destination Truth is like a magic trick, hiding the oft-sought "truth" behind the false-color curtain of FLIR thermal cameras. Through these devices the viewer is treated to the wondrous conjuring of red-hot Blobsquatches and the bright yellow Blob Ness Monster. 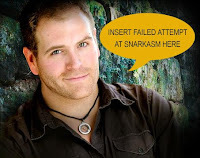 Unfortunately, the only thing truly eluding Josh Gates and his crew is a reason to stay tuned. One can only stomach so many fleeting glimpses of whatsits through these devices, which have become the crutch upon which the show limps, before groaning aloud, begging for something more concrete. To the show, the benefit of these gizmos is obvious: it provides tantalizing "evidence" to examine and keeps the viewers hooked. However, unlike Ghost Hunters - Destination Truth's more disciplined cousin - Josh Gates and his team don't often take the time right then and there to explain their thermal anomalies. These images are seldom corroborated by standard or infrared video, which would, at the very least, establish scale and relative position. Is that a tree? A boulder? Is it that thermal target standing atop the rock or rising up from behind it? It strikes me as I watch the show that little can be discerned by the poor resolution of a device that was inarguably built for an altogether different purpose. This isn't the military/law enforcement grade FLIR used to track targets from helicopters above. This is the type of device used by individuals in the Air Conditioning and Heating industry. So, while it might provide supporting evidence, Destination Truth is foolish to rely so much upon editing images from this gadget with cuts to the fearful faces of assistants. Spare us the reaction shots from frightened but otherwise useless "assistants" who contribute little more to the expedition than being "scream queens".